Summer outdoor parties are some of the best events of the year. The warm balmy nights, food cooking on the grill, and friends and family spending quality time together in the backyard or around the pool create wonderful memories that last a lifetime. But, hosting outdoor events also means there’s an increased risk of home fires. NEW! NFPA is now a regular content contributor for Martha Stewart Living! Check out our latest outdoor entertaining blog post on her website. 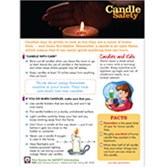 NFPA has several safety tip sheets related to outdoor entertaining that you can download for free, including: candles, fireworks, gel fuel safety, grilling, lightning, outdoor electrical safety, portable fireplaces and sky lanterns. 10 top tips provide 10 ways to save lives and prevent fires! 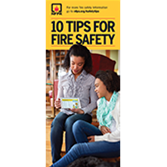 Order the new 10 Tips for Fire Safety Brochures today.